Ripples, ripples, ripples! They are everywhere. I can’t tell you how many times that I walk into a home to deal with a tear or something and I see the ripples. The client didn’t even think to call me for those. Sometimes I wonder if most people think that they just need to live with them. NO YOU DON’T! We can get rid of those for you with a power stretch. Here is a ripple that a customer had in the entryway to his master bedroom. He blew it off for months until he started tripping on it. Within an hour his carpet was flat & beautiful again! 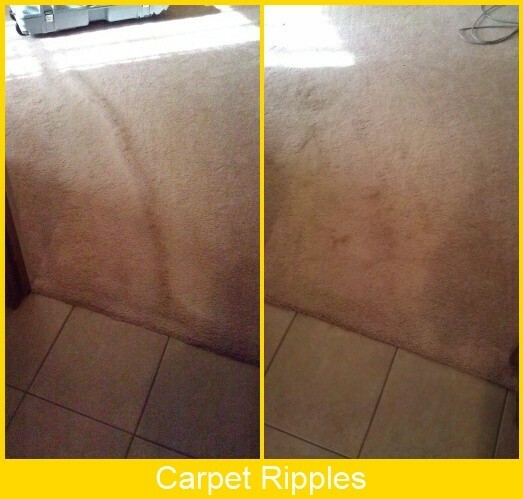 Call us when you have no nasty ripples and don’t forget, we also will do your carpet cleaning!